Under a financial Guarantee the Bank undertakes to discharge the financial liability of the third party in case of default. These are usually given on behalf of Contractors in lieu of earnest money. Financial Guarantees in relation to tenders are called Bid Bonds. Bank undertakes to pay as demand the guaranteed amount if the Tenders has failed to enter into contract despite success in the Bid/Tender. 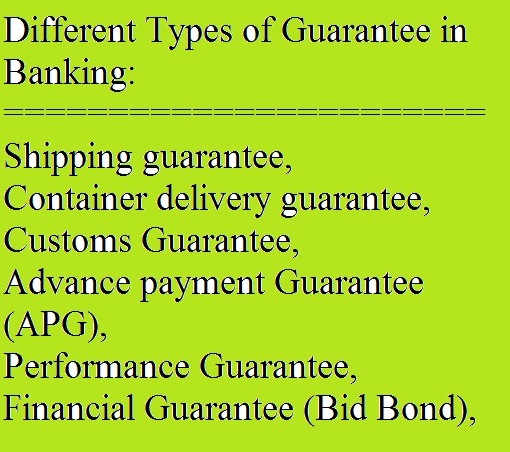 Guarantees, which are extended in consideration of specific performance of contract are called performance Guarantee. These are given to Government Departments or Public Bodies on behalf of contractors undertaking the payment of guaranteed amount in the event of non-fulfillment of contracts such as completing Tumkey projects, Clearing of goods at port, Sale of goods within the Country etc. provided. The Guarantee in question is involved according to terms and conditions agreed upon before the date specified in the Guarantee. After awarding any work order to any Contractor by work order giving agency, the contractor has to start the work, just to start work smoothly, work order giving agency provides some portion of fund to the contractor as advance payment. For that advance payment, work order giving agency requires a guarantee from any Bank so that the contractor does not breach or misappropriation of fund. This guarantee is issued infavour of customs authority on account of customs duties or excise duties on Imported goods and machinery or export commodities on behalf of clients. Our Bank retains 100& margin against customs guarantee. Bank issues guarantee in favour of shipping agents in case of delivery of the containers (with cargo) for unstuffing (from port to Importer’s factory premises or offices) and to return the container as imply without any damage to the container yard of the shipping agent. The beneficiary may encase the same in case of damage or non-return of the container. Bank issues guarantee in favour of shipping companies for release of goods in the absence of shipping documents, in case of goods arrive before receipt of such documents by the Bank and are incurring demurrage of original shipping documents have been lost after retirement from Bank. These guarantees are limited to bill amount or letter of credit value and for the period till receipt of original bill of lading. The guarantee is actually signed by the Importer in favour of the shipping company and countersigned by the Banker. Normally, full value of Invoice or letter of credit must be retained as margin for issuing of guarantee. Alternatively, the goods may be cleared by Bank and kept in its custody. As soon as the original shipping documents are received these shall be sent to clearing agents to facilities return of original guarantee. 01 Name of Party In case of Guarantee there are three parties viz-the principal debtor, the creditor and surely. A contract of the guarantee requires the concurrence of the three parties. In case of Indemnity there are only two parties viz Indemnified and Indemnifier. 02 Number of contracts In case of Guarantee there are two contracts. One between the principal debtor and the creditor and second between the surety and the creditor. On the other hand, in a contract of Indemnity, there is only one contract between the beneficiary. 03 Request In a contract of Guarantee, the Guarantor undertakes his obligation at the request, express or Implied of the principal debtor. No such request is necessary in request an indemnity. 04 Nature of liability In a contract of Guarantee the liability of the principal debtor is primary and that of surely is secondary. The person giving an Indemnity is primary and Independently liable. 05 Purpose of contract A contract of guarantee is to provide necessary security to the creditor against the loan. A contract of Indemnity is made for reimbursement of loss. 06 Right of parties The surety has the right to recover from the principal debtor the amount paid by him under the contract of guarantee. The Indemnifier can not claim reimbursement from any body else. 07 Nature of Risk The surety agrees to discharge the existing liability of the principal debtor. So it is a subsisting Risk. The Indemnifier promise to save the indemnified against Risk of loss happening in future, So it contingent Risk.